What rhymes with Zapple apart from apple? There's even some that do not rhyme! Listen to the book, there's so much more. Or my slugs and I will go to war! Fun and zany rhymes for preteens. What made the experience of listening to Elias Zapple's Rhymes from the Cabbage Patch (Zany, Funny, Illustrated Poems For Ages 9+ Book 1) the most enjoyable? The combination of Zapple's zany mind and Richard Mann's playful delivery is perfect for this humorous and inventive odyssey. I love Zapple's slugs. Shall I tell you about the slug that shocks? Nah, better make you listen for yourself. Cinders and Goldilocks came a close second, but I am a Zapple slug fan. As Zapple shows you slugs as you've never thought to consider them, she transports you to a world where the commonplace becomes extraordinary. This book removed me from the commonplace, lightened my load, and made me happy when I really needed some relief. Highly recommended for its ability to totally transmute reality and you with it. Loved it. Long live Zapple, slugs and all. 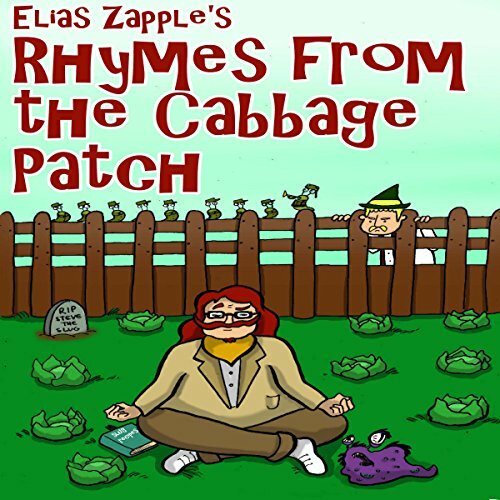 Would you consider the audio edition of Elias Zapple's Rhymes from the Cabbage Patch (Zany, Funny, Illustrated Poems For Ages 9+ Book 1) to be better than the print version? Although this audio edition by itself is enthralling and entertaining it also compliments the print edition perfectly! What other book might you compare Elias Zapple's Rhymes from the Cabbage Patch (Zany, Funny, Illustrated Poems For Ages 9+ Book 1) to and why? This book is comparable to work by Roald Dahl but it is very original and laced with Elias Zapple's twisted sense of humor! I love Elias Zapple's take on classic nursery rhymes. They are very off the wall and funny! Zany, zany and even more zany! I really enjoyed listening to this and will many times!